Named for the Latin words for sea and of the water, aquamarine is the greenish-blue to sky-blue member of the same mineral family as emerald. Believed to protect sailors and calm waves, this gemstone has been a symbol of youth, hope, health, and fidelity for centuries. 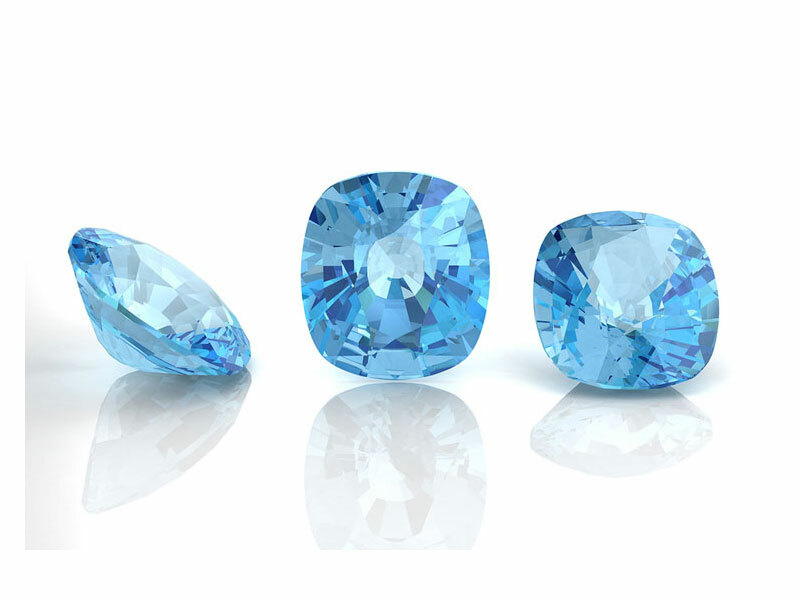 In addition, aquamarine has been said to make the wearer amiable and to quicken the intellect. So these attributes make this gem a good choice to wear even if your birthday isn’t in March. 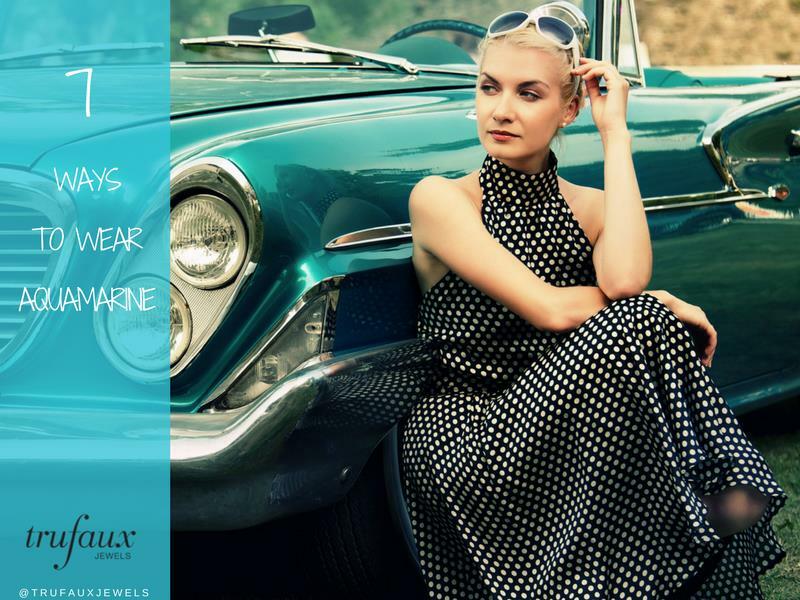 And TruFaux Jewels offers a lovely selection of vintage aquamarine jewelry. Colors are classified as either cool (greens, blues, and violets) or warm (reds, oranges, and yellows). 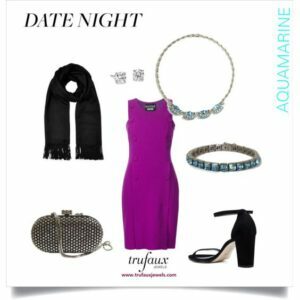 Because aquamarine is a blue-green, it is a cool hue and is most flattering to women who look best in a cool color palette. If you’ve heard of Seasonal Color Analysis, you know that it categorizes people into four seasons, based on the undertone of their skin. Those with a cool (blue) undertone are Winter or Summer; those with a warm (yellow) undertone are Autumn or Spring. More recently, the four seasonal palettes have been expanded, to take into account the fact that many people have coloring characteristics common to more than one season. If your palette is warm, do you have to eliminate aquamarine from your jewelry wardrobe? Absolutely not! 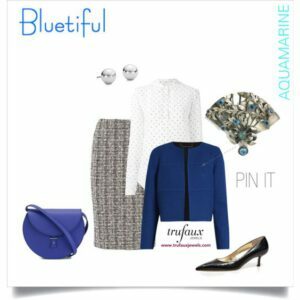 Let me show you outfits for both warm and cool palettes, each styled with a TruFaux jewel in this gorgeous hue. Although this Aquamarine, Diamanté & Sterling 1940s Leaf Brooch has a rose-gold finish (pink is a cool color), the metal looks more like peach (a warm hue). Yellow- or rose-gold pieces are warmer than white metal, so they’re a good choice for adorning Autumns and Springs. 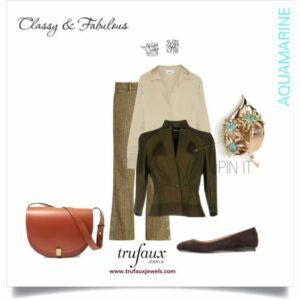 On the left, Classy & Fabulous features an outfit for an Autumn palette: the clothing and accessories have a gold undertone; the colors are deep and earthy. On the right, [de-light-ful] shows a Spring palette, which has a yellow undertone. Here the colors are lighter and brighter than those in the other ensemble. The only deviation I’ve made from the seasonal palettes is with the diamond stud earrings. Strictly speaking, they are most appropriate for a Winter (cool) palette, but I see them as being a universal jeweled accessory. You could also wear rose-gold hoop or ball stud earrings with this brooch. This Aquamarine, Ruby, Diamanté & Sterling Flower 1940s Brooch/Pendant has a yellow-gold wash (vermeil), which makes it suitable for a warm palette. 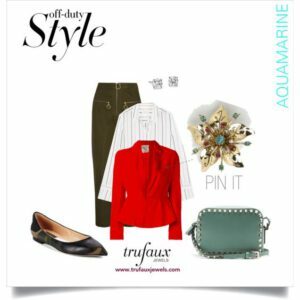 Pinned to the lapel of this vivid red blazer on the left, the brooch compliments this Off-duty Style ensemble for Autumns. These colors – olive pants, ecru striped shirt, and camouflage-print shoes – have a gold undertone. Simply Divine, an outfit for Springs on the right, shows the same jewel on the shoulder of a light brown dress. As an alternative, you could attach a gold chain to make the brooch a pendant. The other accessories in this ensemble have a yellow undertone and are lighter than the Autumn hues. 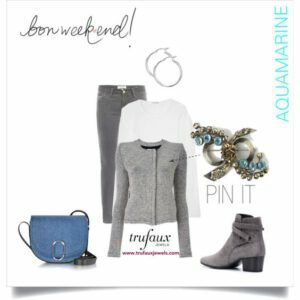 Here are two outfits for Winters, both featuring aquamarine set in white metal. For Date Night, on the left, I’ve chosen this Aquamarine & Diamanté 1950s Necklace by Bogoff and this Aquamarine & Sterling Art Deco Line Bracelet. Although the pieces were made decades apart, the Art Deco style is so clean and classic that pieces from that period can often be combined with newer ones. These jewels adorn this magenta dress. Black accessories and diamond studs complete the look. Bluetiful on the right combines two black-and-white patterns with cobalt blue. This richly-textured Aquamarine & Sterling Fan 1940s Brooch by Hobé is pinned to the jacket. 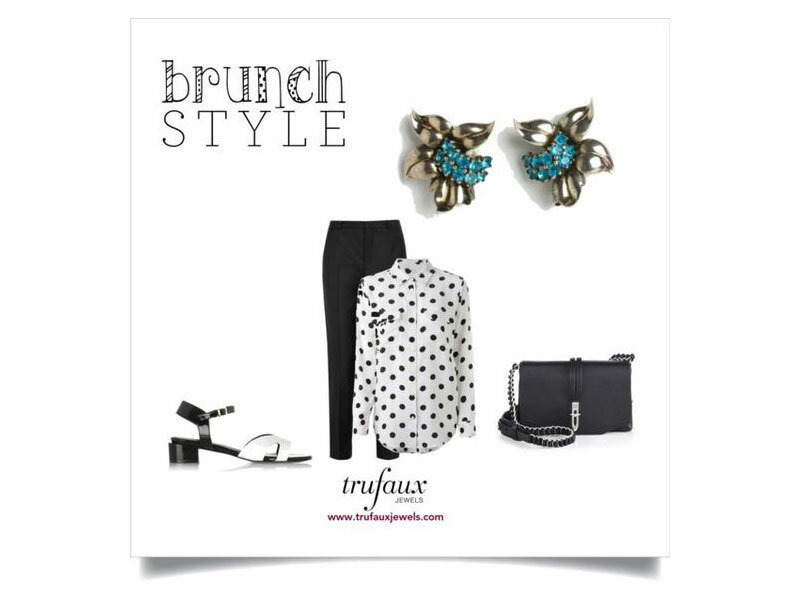 Simple sterling ball stud earrings complete the jeweled accessories. For Summers, I’ve put together a grey-and-white outfit adorned with this Aquamarine & Vermeil Sterling Bow 1940s Brooch by Hobé. The Summer palette features muted colors with a blue undertone. The crisp white tee shirt, grey pants and jacket, and denim blue bag fit the bill. I’ve shown simple sterling hoop earrings, but you could also wear sterling studs. Just right for a bon weekend! See my collection of aquamarine jewelry here.